Home » Get a Customized HR Software, Say No to One-Size-Fits-All Option! » Blog » Get a Customized HR Software, Say No to One-Size-Fits-All Option! A one-size-fits-all HR software is designed and developed to meet the basic needs of any business. However, organizations require unique solutions to cater to specific problems and needs of their people and business. Thus, there is a growing requirement for cloud based customized HR software that can be personalized and map to the existing processes of an organization. This is the major reason for saying NO to a one-size-fits-all HR software application. What Does Software Customization Mean? Software customization is the process of developing a tailor-made application for a business. 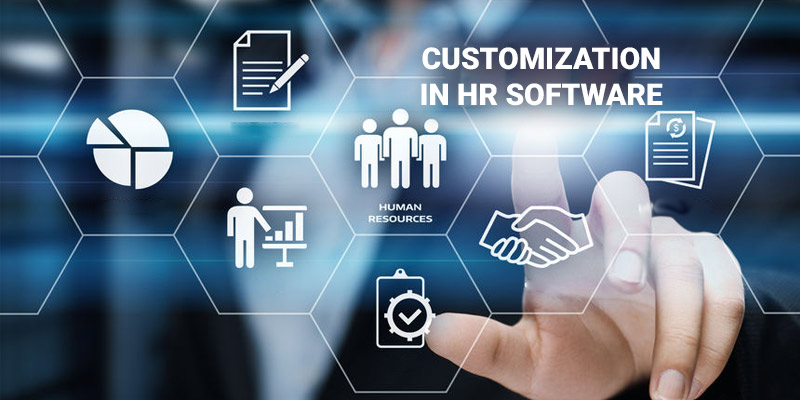 Customized HR software is developed to cater the unique requirements of an organization’s different departments and its employees, and it maps to their existing business processes. Using a customized HR solution that meets business needs is a worthwhile investment. It is customer focussed with numerous benefits. Maps to the Existing Processes. Software customization simplifies mapping of existing requirements and processes of the organization. The processes are automated without making changes in the existing workflows. Result-Oriented and Efficient. Efficiency is the key to success in a competitive world. Customized solutions become a tailor-made platform for managing daily operations and tasks with ease. They are focused on producing the best results with high efficiency and keep the business moving forward. Prevention Against Data Security Breaches. Protect the software from external threats. It is a well-known fact that majority of hacking attempts become successful as they are performed on known software vulnerabilities, in commonly-used software. Hackers see customized HR software as a less attractive target as it requires comparatively more effort to learn how to breach the system. Multiple Visibility and Access Controls. Customize access and visibility permissions for different user roles depending upon the specific requirements. Maximum Configurations. Any good customized solution should provide maximum configurability to add more value to the offering. The users can get configuration options in the product that can be tweaked in just a few clicks, as and when required. Configurations are originally designed by following best HR practices and industry standards, and they meet out-of-the-box requirements of the client. Custom Forms and Rules. 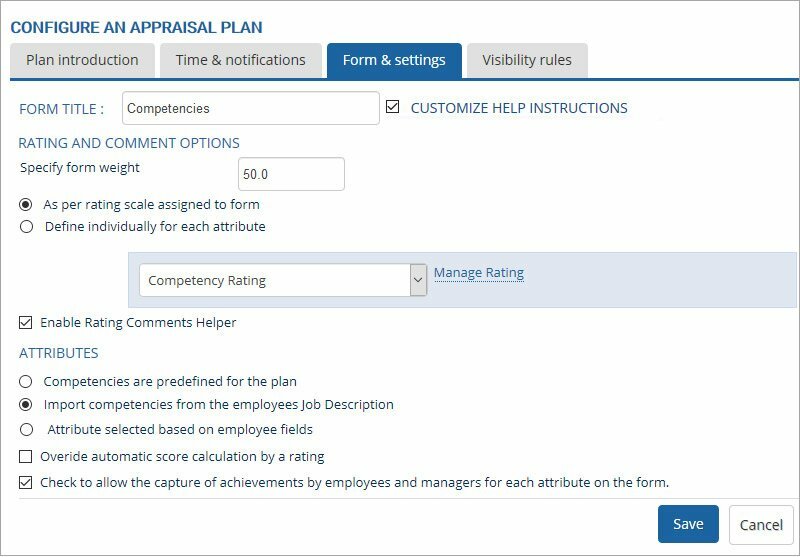 Performance appraisal forms can be customized by the user (HR) to meet specific process requirements. 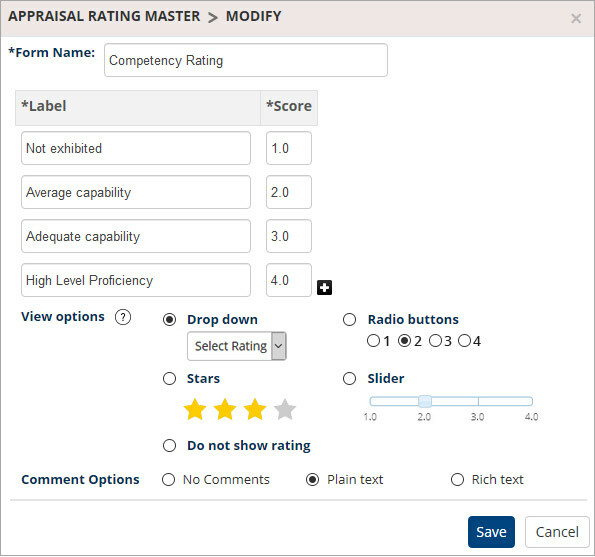 Changes can be made easily in the rating style of appraisal forms. These customization options simplify the process and make it user-specific. Tailor-made Reports and Easy Identification of Trends. 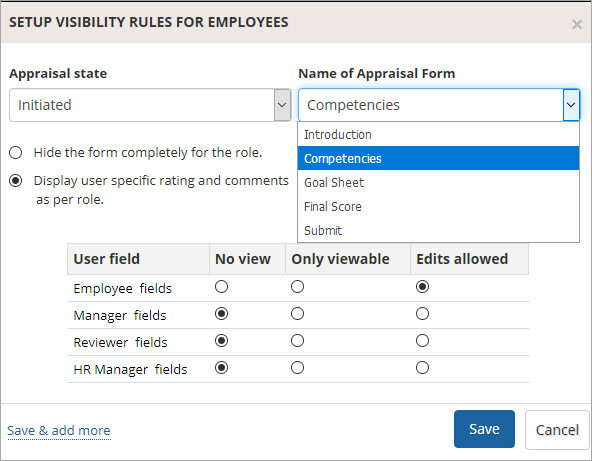 Generate multiple tailor-made reports for all stakeholders, including the leadership, HR, managers and the employees. Customize your dashboards and enable easy analysis of data and quick decision making. Patterns in workforce productivity, headcount, absenteeism, appraisal status, employees’ leave frequency, goal completion status etc can be further identified. Personalize the Product. Personalization is the need of the day as it gives a private label to the brand with numerous options to completely customize the look and feel of the software. The product can be branded and personalized as per the preferences. Basic customizations, like change in colour scheme, fonts, layout, logo, menus, reports, features and more, can be done to provide a tailored user experience. Scalable and Reliable for Long Run. Meet client’s present and future requirements. A custom product can easily grow and adapt with your organizational changes. Its capabilities can scale up easily with the growing needs of an organization. No need to look and migrate to a new software due to changes in processes or increase in employee numbers. Attract and Retain Top Talent. Give a customized experience to job candidates and employees by customizing your recruiting practices and providing customized offerings. This will not only increase the engagement levels but will aid in attracting and retaining top talent and enhancing the overall productivity of the organization. User-Focused Development. Custom software development team assists at every step of the process, from the planning stages to implementation. Necessary training is provided for optimum adoption of the product. No need to read instruction booklet to get started with the product. It is also ensured that the entire workforce is fully trained on the new system. Research indicates a major shift towards highly customizable HR software solutions. Customization offers countless benefits when compared with a licensing off-the-shelf software. Scalability, extended support, guaranteed & timely maintenance, integration in the company’s existing software environment, to name a few. If your organization needs a customized HR software that can integrate well with your existing processes, then get in touch with Empxtrack team to discuss your requirements. Empxtrack offers maximum configurability and customization, with custom-made workflows, forms, user interface, access controls, leave & attendance rules, and more. Infographic: Why Do We Need a Cloud-Based HR Software?